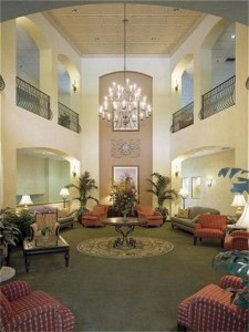 The Holiday Inn Laguna Hills Hotel is the perfect location for business or pleasure in Orange County. The hotel is located mid-way between Los Angeles and San Diego, off Interstate 5 at the La Paz exit, with easy access to the John Wayne Orange County Airport, Laguna Beach, Irvine Spectrum, Mission Viejo, Aliso Viejo and Rancho Santa Margarita business communities. With 24 hr notice the hotel provides complimentary shuttle service to the Orange County Airport between 7AM and 9 PM and is based upon availability. We request a minimum of 24 hour advance booking notice to review shuttle requests. The Holiday Inn Laguna Hills is a non-smoking hotel. For recreation, Disneyland, Knott's Berry Farm, Laguna Beach and Mission San Juan Capistrano are close by. Holiday Inn Laguna Hills features 147 spacious guest rooms. Restaurant Soleil offers a Mediterranean California cuisine in a casual atmosphere and there is dancing and entertainment in Charlie's Lounge. Meeting space is designed to accommodate 5 to 400 people. We have a total of 10,000 square feet. This hotel is committed to providing accessible facilities under the American Disabilities Act. If your accessibility needs are not met, please contact the Hotel Manager on Duty. Should you require additional information regarding accessible facilities for guests with disabilities, please call 1-800-Holiday (U.S. and Canada) or contact the hotel directly. For the hearing impaired, TDD service is available at 1-800-238-5544 within the U.S. and Canada.